It's been a long time since I got married, but I still remember the excitement and nerves that went along with that special day. We had a lovely catholic wedding, which if you don't know, goes on for at least an hour. And why not, you spend so much on your dress and flowers and stuff, it should last a good long time. Altogether, with the rehearsal dinner, reception, and the ceremony itself it was quite the event. So what was it like when our puritan ancestors married? Here is what I know about Puritan weddings. The age at which men and women are marrying, for the first time, is rising. In 2012 the average male married at 29 and his wife was 27. There are multiple reasons for this trend, including simple economics. In order to get married, support a family and live a decent life, one needs a certain amount of income. This is becoming harder to achieve and takes a bit of time to reach a level of economic security on which many couples feel it is safe to marry. This was the case in England and the Massachusetts Bay Colony in the 1600 and 1700's. In England the conditions were worse than New England and as many as 30% of adults never married. In Massachusetts almost all adults of marriageable age married. Most widows and widowers promptly remarried after the death of their spouse. Many adults married two even three times in their lifetime. But, the age at which they first married was much like today. Men needed some measure of economic freedom from their fathers to support their wife and their inevitable children. Most of the men in the early days of the colony made their living by farming and raising livestock. They needed land to do this. Fathers seemed reluctant to part with their land but would often allow sons to farm portions of their land, often virgin land, that had yet to see a plow. Less often fathers would outright deed land to their sons. If there were a lot of sons in the family, some would be apprenticed to learn a trade in order to earn a living wage. Men got married on average at about 27 years of age. Women worked at home with their mothers or step-mothers from a very early age learning to run a household. They would have to learn to make meals from scratch, make soap and candles, and how to sew their own clothes. They might also work as a servant in another home. Women got married on average at about 24 years of age. The Puritans believed in the family as a unit. Everyone must belong to and live with a family. There were no bachelor pads, or boarding houses. In 1668 the Court of Middlesex County conducted a search for single people and forced them to choose a family to live with. The only way to move out of a family home was to start your own, but first you had to find your mate. Although the Puritan lifestyle was highly restrictive, boys will be boys and girls will be girls and they will find a way to meet. Once a week, on the Sabbath, everyone in town came together at the meeting house for Sunday service. This would ensure that all eligible men would meet all eligible women. Many people married locally to men or women they grew up with. Families became complicated with intermarriage and in a small town many families would be related by marriage to each other. Surprisingly, Puritans believed that couples should marry for love, this goes against my image of the dour strict and loveless people of my imagination. Parents and children must give their free consent to marry. Men generally asked permission of the woman's father to court her. I was somewhat surprised to find that the bundle board was not a myth but actually used. The prospective couple were allowed to spend the night, together, in the same bed, separated by the bundle board. If at the end of the courtship the couple decide to marry they would enter into a 'contraction'. The couple would post their banns at the meeting house three times. The prospective bride would be allowed to choose the text for the minister to preach, this was her day in church. If there were no objections the marriage could proceed. No doubt there were some negotiations going on. The couple had to live somewhere, either in a new household of their own or with one of their parents. The couple would need furniture and other household items to start their new life together. Today many couples choose to marry in the month of June, Puritans preferred November. There was no need for a wedding planner, wedding gown or even a church. The couple married at the bride's family home. The local magistrate or, if the marriage occurred after 1686, the local minister arrived, asked the couple if they wanted to marry and if they both said yes...they were married. That's it. The marriage was recorded in the town records and the families might have a little party with small cakes and a beverage, but no party, no dancing or feasting. If a couple were determined to marry and the parents disapproved, they could 'self marry'. I'm not sure exactly what they had to do to achieve this, but I could probably make a few guesses. If they did 'self marry' they could petition the court to recognize their marriage. A surprising number of my ancestors were obviously pregnant at the time of their marriage. A 'premie baby' that looked 'full term' was a dead give away. The couple would be reported to the local magistrate and hauled into court charge with fornication. The court would typically sentence them to be whipped or pay a fine. A single woman who became pregnant by a reluctant father would also find herself in court. Witnesses would be called to testify on behalf of both parties. If the man denied being the father the court would wait for the birth to occur. At the height of the woman's labor pains the midwife would ask her to name the father. It was believed that the woman, in total agony could not lie. If the court believed the mother, the father would be given the choice of marriage or financial support for the child. The woman was then promptly returned to her family. William Sargent Jr. was born 2 Jan 1645/6 in Salisbury, MA the son of William and Elizabeth Perkins Sargent. 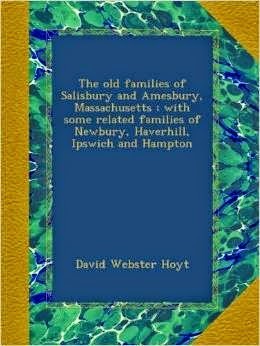 His father was fairly well to do and his mother's sister was married to Thomas Bradbury, a prominent citizen of Salisbury and the Colony. Not to long after his birth, William's father moved the family across the Powwow River to the newly established town of Amesbury. This is where William Jr. made his home, married and raised his family. Unlike his father, who was a Seaman, William remained firmly on land. William married Mary Colby, daughter of Anthony Colby, also of Amesbury on 23 September 1668. William was 22 and Mary was 21. They were younger than the average newly wed couples. In April of 1699 William and Mary were presented in court for fornication, their first born child must have come a wee bit early and looked a bit too much like a full term baby and was therefore judged to have been conceived before their marriage. Mary and William paid a fine to avoid a whipping. Although it seems out of the ordinary for a Puritan couple to have had "premarital relations" it was not uncommon. A reading of the records of the Quarterly Court of Essex can give you a good idea of the moral standard and the reality of living up to it. Many brides, it seems, were pregnant on their wedding day. William was on of those rare and lucky sons whose father gave him land during the father's lifetime, in other words, William did not have to wait for his father to die to inherit his land. On Oct 9, 1669 William Sr. gave his "beloved son" William a lot of 200 acres of upland in Amesbury, a lot of 8 acres of upland in the ox common, a 40 acre lot west of the great pond, a 45 acre lot of upland in Urchin Meadow Hill, and half his first division of the higledee pigledee lot of salt marsh in Salisbury. This was a tremendous gift of land from Father to son. Maybe the fact that the land, at least the 200 acre parcel, was given to William Sr. from his father in law made it easier to part with. Not much is known about William, he was a farmer by occupation. He took the oath of Allegiance in 1677. And that's about it. There were other children whose births and deaths went unrecorded. Jacob was described as the 5th son of William and Mary so there was at least one other son born before him. The deaths of William and Mary went unrecorded by any source available today. We know he was dead by 1720 when his surviving children; William, Jacob, Philip and Elizabeth quitclaim a deed to Mr. Henry Deering for some land that their father had mortgaged to him in 1693. Since Mary's name does not appear on the 1720 deed, she was probably not alive at that time. A William Sargent died in Amesbury on 31 March 1712, he was styled William Jr. Some people seem to think that this was our William but I disagree. Firstly, the designation of Jr. was not only used to show a father son relationship. Often times when two men with the same name, be they father/son, uncle/nephew, two cousins, or two unrelated men, lived in the same town, the older would be senior and the younger would be called junior. So, just because a William Jr. died, it did not necessarily mean it was a son of William. The administrator of William's estate was his brother Thomas. Thomas Sargent older brother of our William had two sons named Thomas and William. I believe that the William who died in 1712 was William son of Thomas. When he died this William had a meager estate comprised of one book and some money. Our William had grown sons, more than capable of administering their father's estate and their would be no reason to appoint a brother. If I was to make a guess, I would say that William died closer to 1720 when the quitclaim was written by his children.